MacManus/McCartney; McCartney. Very Good. In very good packaging. 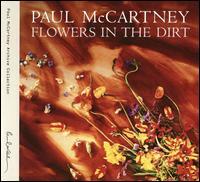 Paul McCartney-Flowers In The Dirt by Paul McCartney. MacManus/McCartney; McCartney. Fine. In fine packaging. Paul McCartney-Flowers In The Dirt by Paul McCartney. Very Good. 602557244151 Case in very good condition. No scratches to CDs. Support Last Word Books & Press and independent booksellers. Good. No packaging as issued. 2 discs. Originally released: 1989. EX-LIBRARY'S withdrawn Music S DISC. THIS DISC S CONTAINS LIBRARY S LOGO AND MARKER S MARKS (91712CDVD) ISBN: 602557244151 PLEASE READ THE FOLLOWING SPECIAL DESCRIPTION CAREFULLY: This sale is for a (SET OF 2 DISC). This DISC (s) Contains visible Scratches) Case is (Good) Tab s Cover (good) DISC s Holding tab is (Good). Missing Cover pamphlet (no) This CD is contains Marking on the Discs and the case.